The best break-in, conditioning and maintenance system for your rifle's barrel is now available in a Complete Care ProPack at a savings of more than $10.00 over the price of the two items if purchased separately. 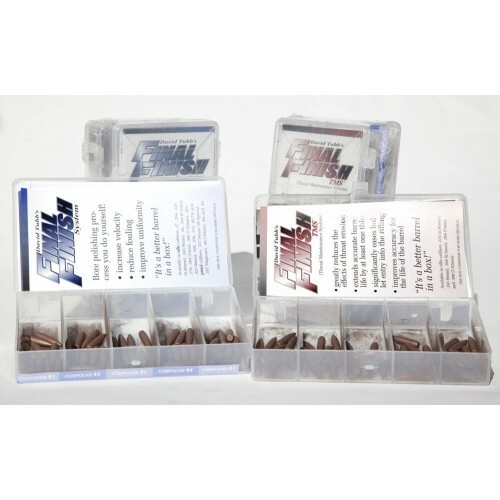 We have combined our FinalFinish break-in kit, consisting of 50 lapping and burnishing bullets, with a Throat Maintenance System (TMS) kit of 50 polishing bullets for period maintenance, in a Complete Care ProPack to save you money! This complete system allows you to properly beak-in factory or custom barrels and then maintain them at their optimum smoothness and accuracy throughout their shooting life. These products will also bring older barrels back to life by smoothing away the effects of throat erosion and use.